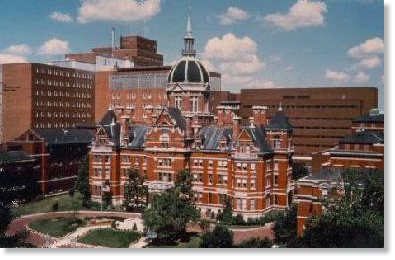 Well, I am happy to report that my wife’s surgery went very well and that she is safe at home after over a week’s stay at Johns Hopkins Hospital in Baltimore. The Neurosurgeon performed a Laminectomy, which is a surgical operation to remove one or more sides of the rear arches of a spinal vertebra to gain access to the spinal cord. Judy had developed a very large tumor on her spinal cord which had to be removed. The tumor had grown to occupy 85% of the space around the spinal cord and would eventually cause paralysis. The surgery lasted almost 9 hours, but was deemed successful by her surgeon. During Judy’s stay at Johns Hopkins Hospital, dozens of technicians, nurses, and specialists visited her and all the Neurosurgical patients occupying the 8th and 9th floors of the Meyer Building throughout the week. One specialist in particular, the Pain Management Nurse, asked me a question while she was reviewing my wife’s medications. She asked if I was from the Baltimore area originally. I told her that I grew up in Duquesne, Pa., which was in the Pittsburgh area. She said that she knew that from the moment I began talking, and that I had a definite Pittsburgh accent. She recognized it immediately since she herself grew-up in the Forest Hills area. Seriously? A Pittsburgh area accent? I never would have thought! Personally, I thought the only distinctive regional accents belonged to Southerners, people from Jersey and New York, Bostonians, Texans and perhaps, people from Maine. Apparently, many people think that those of us fortunate enough to be raised in the Pittsburgh area also have a distinctive sounding accent as well. As a youngster from Duquesne, I, along with all of the residents, fell victim to the “Pittsburgese” dialect that is attributed to the area. In most cases, if the following phrases and/or words are uttered beyond the immediate Duquesne/Pittsburgh area, you will most likely get this quizzical look from whomever might be listening. If you were fortunate enough to grow up in Duquesne however, you would immediately know the true meaning behind the following gems. 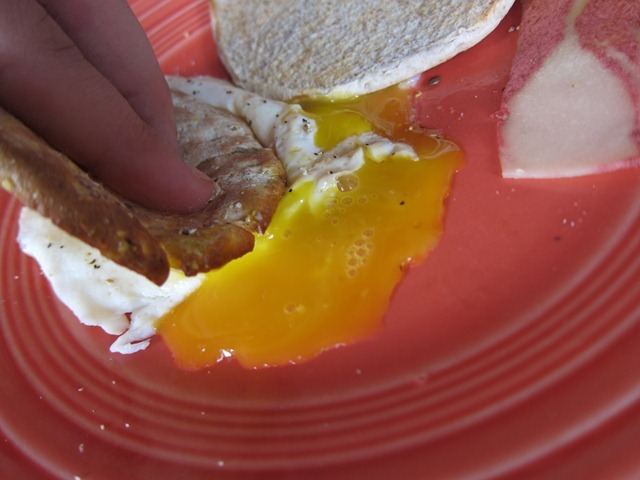 One of my favorite breakfasts was bacon and dunkin’ or dippy eggs. When Mom told me to “red up your room,” I would groan and begin to pick-up my clothes and toys. Any kid would have been thrilled to find a large pop bottle that would be worth a nickel when returned to the store! Another of Mom’s frequent demands was to stay away from the jagger bushes at the front of the house for fear that I’d get scratched. When Mom would come home after shopping with an armful of packages, I’d always ask what she bought. She would always tell me to quit being so nebby! One of the things my dad would always have to remind me to do, was to turn on my blinkers. 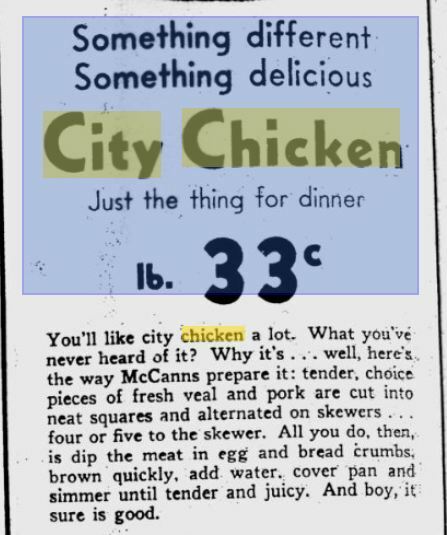 One of my favorite meals, was when my mother would make City Chicken. As a child, my favorite part of any wedding reception was being able to get my fill at the Cookie Table. Undoubtedly, one of the delights that I miss most from my hometown is a chipped ham sandwich on white with mayo! In Duquesne, the best was to describe a gloopy, messy and slimy handful of mud is to call it cucky! I used to use a gumband to hold large piles of paper together. Everyone from Duquesne knew what you meant when you said you were hungry for jumbo. When I was a bit naughty when I was little, I’d sometimes get a lickin’ from my dad on my p’toot. Most of my uncles preferred to work daylight as opposed to nighturn. Now, if you grew up anywhere around the Pittsburgh area, it’s likely that you knew exactly what I meant by the statements above. However, as a Hunky from Duquesne, we also had the pleasure of having a few more idioms in our vocabulary that had their roots in one of the many eastern European dialects spoken around the town. • The large colorful cloth square that women wore on their head and tied under their chin was not a scarf, but rather a babushka. Of course we all knew that. If that babushka was being worn by an elderly women with gray hair and at least one oversized cardigan sweater, that woman was known as a bubba. • Bubbas were grandmothers. They were the sweet little old ladies who always seemed to have freshly baked apple pies whenever you visited, lived in homes that always smelled like soup or cooked cabbage and always, always, always had the sweetest, kindest smile. • Another local phrase that I recall was the “superlative” of the term bubba. If the woman described above was much, much older and perhaps walked with a cane. 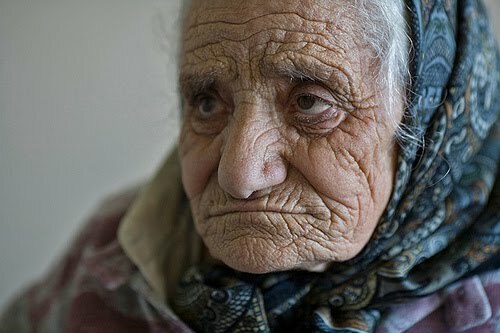 If she toddled down South First Street with tale-tale signs of untreated osteoporosis and carried a well-worn cloth tote bag containing fresh vegetables she just bought at Alexander’s Market. You can easily imagine her kneeling in the pew at Holy Name with her rosary beads clenched tightly as she silently mouthed her prayers. That sweet lady was best described as a studda bubba, an endearing term befitting her age. There were some rather “expressive” words that became part of my vocabulary as well. Words that deal with body parts or bodily functions are not a subject I’ve really addressed before. However, since the theme of this post is idioms, perhaps I’ll earn your forgiveness for discussing them now. Who could ever forget being threatened with a swat on your dupa! That swat rarely happened, but it made me behave like a good little hunky. • Căkă was a more polite hunky was a referring to what little babies left in their dirty diapers and dogs left behind to let you know they had visited your yard recently. I believe that căkă meant the same in both Slovak and Croatian since I heard it from both my mother’s and father’s side of the family. • And finally, going to Puskie’s meant that you’d be buying a treat at the little store at the corner of Mellon Street and Texas Avenue. And so I say “Laku noć” for the evening and hope that you will continue to check back for posts. Things are slowly but surely getting back to normal after my wife’s surgery, and I hope to be posting again soon! This entry was posted in Life in General, Miscellaneous. Bookmark the permalink. I was back to duquesne the first time. In 45 years. Really depressing. Home i grew up in was gone. Galligers drug store boarded up. Looked like gostttown. Did go to the post office godfather was post master. Brought back alot of good memories. It is sad, David, yes, indeed, and scary, if you ask me. It “feels” dangerous. After all, what are people doing to earn money? Can anybody answer that for me? I’ve been advised not to even visit my father’s grave in St. Joseph’s Cemetery, for fear of getting robbed and/or carjacked before I even reach Grant. And the high school wasn’t closed for frivolous reasons, was it. What great memories that brings back. I remember most of those words/terms! Still use most of them even though I’ve been out of the Pittsburgh area for many many years. (I live several counties to the east) Oh, and my little 3 year old granddaughter calls me ‘bubba’! I love that you included the term and explanation for studda bubba. One day as a joke, my young niece called me that. I was about 50 years old at the time, living in California now. While I winced a bit to hear the term addressed to me, I quickly started to laugh and it has become our little joke–a term of endearment. So now that she is 24 and an aunt herself, I call her junior studda bubba or studda bubba in training. The term lives on!!! e-notices, Jim, a smile comes to my soul because I know I am going to be charmingly escorted back to a time when life was full of the special joy of growing up in a wonderful place. Subsequently, when I lived in NYC, I was often told I “had an accent.” When I would return home to Duquesne, from Ohio or NY, to visit, I was told I had an accent. By the time I took my place in the classroom, I had hoped I had thoroughly purged myself of any traces of any accent or term (no more “gum-bands”or “pop” for me) peculiar to my beloved hometown. Yet, I often wondered what the English would have thought of the way I pronounced English! We Americans pronounce many words very differently from the English. I guess that’s why we have “American English” dictionaries, huh. I always found the most telling thing about the Duquesne/WPA accent is the lilt at the end of a sentence. Like “where younz goin” and the “goin” part would be at a higher pitch. No matter if it was a statement or question, it always would be an up lilt at the end. You brought back memories with words I don’t hear often in the southwest. From your blog I also learned a few new ones. I miss the days when my hair was pulled back with a gumband and I walked through jaggers, through the woods and across the “crick” to play with my friends growing up in Pittsburgh. A chipped ham sandwich for lunch was good but ordinary fare back then. To have one now would be a gourmet treat! Prayers and good wishes that your wife makes a full recovery!!!!! It is so nice to hear all those phrases again. We were told about our accent also. We lived in McKeesport, my dad worked at the Duquesne steel mills. In 1970 we move to York, PA, about a 4 hour drive from McKeesport. We were told you people from Pittsburgh sure do talk funny. I came back at them with, well you say soda, we say pop, we may say younz, but you say “yous”. When something was out of stock, the person would say the staples are “all” I said all what? They say 9 “month” pregnant and I am going to buy some “clothe.” I said you are going to buy one thing?We went to the store and asked for a lb. of chipped ham, they looked at us like we were nuts. I am glad your wife is on her way to a speedy recovery, and I look forward to reading more of your blogs in the future. Your rebuttle to their comments was spot on!! Good for you…. or should I say, good for yinz! Nowadays Pittsburghers advertise their hometown using bumper stickers, the international type. They say “YINZ” or “N @” ( as in “I’m goin’ to the Stillers game n at.” or “Let’s go down the southside and get some beers n at.” ) Look for these at the beach this summer. Also, while sitting at a poolside bar in Hawaii in 1990, I must have slipped a “yinz” or two into my conversation with another rep from California. The bartender couldn’t believe what he heard! Turned out he was from Wilkensburg and we never paid for another drink the rest of the night. For future reference Blue Hawaiian’s, the drink, may taste like a melted blue popcicle but I asure you they are much more deadly, N @. LOL! Fr. Shaughnessy would be proud but more likely, he’d imbibe with you. Picturing him in a hawaiian shirt is a funny thought! I don’t know you, but I feel like I do, from all the great stuff you write about the town I grew up in. I was raised right across from Hilltop Dairy, and my Mom who has gone to a better place worked at Kennedy Meat Market when I was a boy. My dad who is also passed worked in the mill for 37 years. I have been in New Mexico since 91. My grandaughter who is only 2 says some of the words you describe here and has never been to Duquesne. I still have the accent and also still use many of the words and phrases i grew up with. I am glad your wife is doing well and will say a prayer for her. Thank You for bringing back many fond memories of our town. I have lived in or visited many parts of North and South America. Two items always gained immediate attention from people I met who (unknown to me) were from the Pittsburgh area. The first was my class ring from Duquesne University. The second ( and more important) item was my unique Pittsburgh accent. Many joyful reunions were accomplished with these two iconic lasting memories of Pittsburgh! Relieved and glad to hear the good news of your wife’s successful surgery. Prayers do get answered. Will continue to pray for her recovery. chaprush (sp?) (the R pronounced with a roll of the tongue) meaning a slap to the back of the head. Here’s one you forgot.. if you were going down street it meant you were going shopping in Duquesne and if you were going down town you were going shopping in Pittsburgh or McKeesport. Growing up in a mixed ethnic family (my father was Italian) I never learned the language but still remember some of the words and when my mother and godmother didn’t want us kids to know what they were talking about they would switch to Slovak or Russian. So glad your wife Judy’s surgery was successful. I have had 3 back surgerys consisting of 2 laminectonies and the third was a stabilization where they put in plates and screws. I didn’t have a tumor but paralization was also what I was looking at down the road if I didn’t have the last surgery. now and walking well and that last surgery was 13 years ago when I was 56. All in all it took about 6 month to a year to feel like myself again so slow and steady works. How about “Where yoonz goin’?” I don’t really know how to spell it, but we definitely have a distinctive term referring to the plural of the word “you”! Glad your wife is doing better! Blessings to you and your wife, Jim. So glad everything went well. One part of the body not mentioned in this blog was the “dupa” as my Slovak parents and grandparents called the backside. As a young military wife I worked at a bank in Anchorage, AK. I opened accounts. As I spoke to a young couple, they asked if I was from Pittsburgh? I was surprised and said yes, how did you know? First they mentioned the accent, and second was I said younz!!! Glad to hear that Judy made it thru the surgery. Hoping and praying for a speedy recovery for her. Thanks as usual for all the old memories you bring back. My grandson is dating a Croatian girl and it fun to listen to her and her father speaking. Brings back lots of memories. My son-in-law is Romanian and though the language isn’t hunky our food likes are very similar. In my travels & living in various parts of the country I always got tagged as a Pittsburgh area person by use of the word “yinz” [sp varies] which I was told was unique to our area of PA.
One day I was telling a story to a group of my friends from the Pittsburgh area about how all of our dads worked in the Duquesne Mill and that when we needed a ride somewhere we’d ask each other ‘what turns your dad on’? Everyone looked at me really funny and one girl said ‘what kind of town is Duquesne!’ I asked her why she said that and she answered ‘because of what you just said’. It turns out that everyone else calls it a ‘shift’ – not a ‘turn’!!! We all had a good laugh. So then I told the story to all of my friends from Duquesne and they looked at me funny too – but it was because they couldn’t figure out what I said wrong…. when I told them, I had another great laugh! It seems that us folks from Duquesne do have our own way of talkin’! Sending prayers your way for your wife…and you. Gotta give props to the caregivers. Although I have lived in SC for over 30 years and my kids were born and raised here they know what all of those terms and phrases mean. Another one that they know but I don’t know if my Mom was the only one that said it or it was a Duquesne-ism – “Quit Rutching” which she usually used in church when we were sqirming too much! Oh and Jim, glad your wife is doing well…wishing her continued healing! And I think it’s funny that people from Duquesne can’t hear their own accent. I can tell someone is from the Burgh very easily. Hey Ron, just wanted to take the opportunity to say hi and hope to see you this at the 50th this year. Sharyn, if your driving to Key West & looking for a stop over, Karen and I are living in Myrtle Beach. We’d get a kick out of seeing you. Your welcome at the RBK Inn. Where in Myrtle Beach ?? I;ve been in Wilmington, NC since ’94. Hope you are doing well..
Hi Ken, I’m in Murrells Inlet – Blackmoor Golf Community. Yeah, I knew you were up in Wilmington. One of these times when Bernie visits I was hoping to meet you half way for Dinner. Let me know when Bernie visits. He never makes our reunions. Would love to see him.. Welcome back, Jim! We’ve, and I’m certain I speak for everyone, been more that a little concerned. As my old Irish mother would say “Thank God and the Blessed Mother” that Judy’s alright. My Grandmother used to call the sofa a Davenport. Glad to hear surgery went well…on my way to the FL.Keys to visit with Duquesne people – Sloss sisters & Bob Stavor – The Duquesne Hunky will help us in our yearly reminiscing. My mom & aunts always used to sing this song “ishliz may, kolovata, walking down the street……can’t remember the rest or what it meant…driving my cousin & I nuts! Anyone out there know? Whishing your wife a speedy recovery. You posts are an endearing recall of what made our childhood so special and our golden years enriching as we have lived long enough to fully appreciate the gift the adults of Duquesne gave their children. A childhood foundation that produced some very fine people.